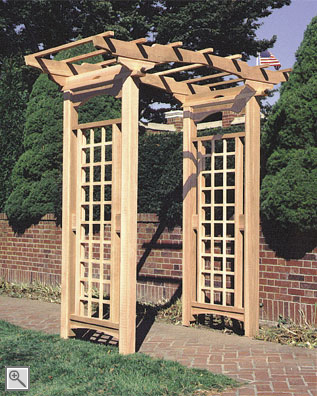 A traditional, pergola-style top accents this uniquely beautiful arbor. Available with or without our lattice extensions, or with any of our gate styles, as referenced in our Gate and Extension section. Constructed of western red cedar, 4" x 4" posts, Cambara mahogany lattice and stainless steel fastenings. The walk-through opening for this arbor may be customized to sizes of 6' or greater. Call for pricing and shipping details.